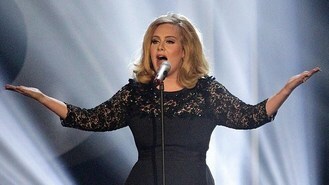 Presented with the award by Eurythmics singer Annie Lennox, Adele said she learned from the reviews of her first album. She said: "The main thing was, my songs weren't as good as my voice, which I hadn't realised but I took it on board and now I'm songwriter of the year." She dedicated the award to her manager Jonathan Dickins and said: "This award is going on your shelf, not mine." The Grammy Award-winning singer also picked up the award for most performed work for her song Rolling In The Deep at the central London ceremony and joked she never expected it to be a hit. She said: "I really didn't think it was going to do anything anywhere." There were also awards for Take That who were honoured for their outstanding contribution to British music, and Lana Del Rey, who won best contemporary song for Video Games. The annual awards are highly prized because they are voted for by songwriters and composers. Speaking backstage at the Grosvenor House Hotel, Gary Barlow said the award was the one "that really matters". He added: "We go to a lot of award shows but if you were to see the pleasure on the recipients' faces when they get an Ivor, it's just something different and special and its a beautiful award show and I'm proud to be here and proud to win one." Ed Sheeran won the award for best song musically and lyrically for The A Team, and PJ Harvey's Mercury Prize-winning Let England Shake was named best album. Spandau Ballet's Gary Kemp was presented with the award for outstanding song collection, while Siouxsie Sioux picked up the Ivors Inspiration award.